Just like with my Thai Green Curry, I went the lazy route by using prepared Pad Thai sauce from the store. 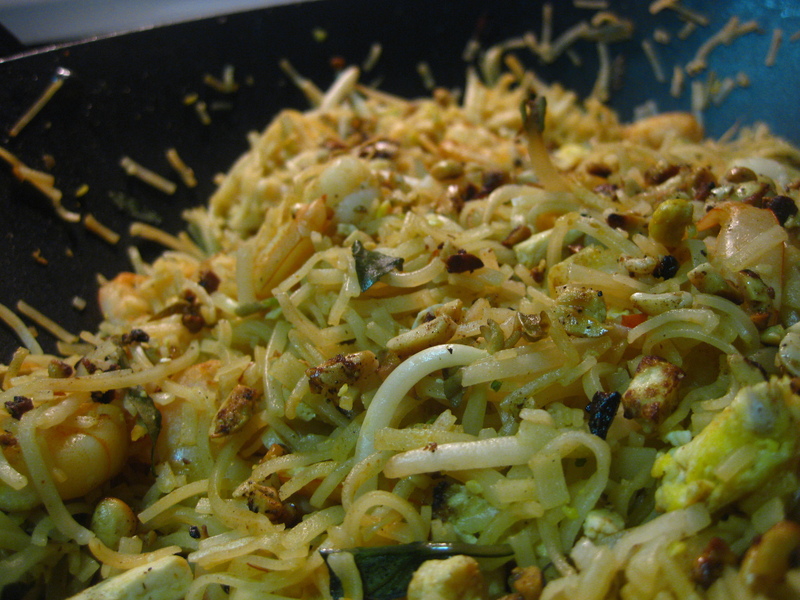 The sauce for Pad Thai is much easier to replicate as it requires considerably less ingredients than curry paste. Most sauces call for some combination of tamarind, sugar, fish sauce, vinegar, tomato paste and chili pepper (some recipes substitute ketchup or honey), which can be easy enough to acquire. 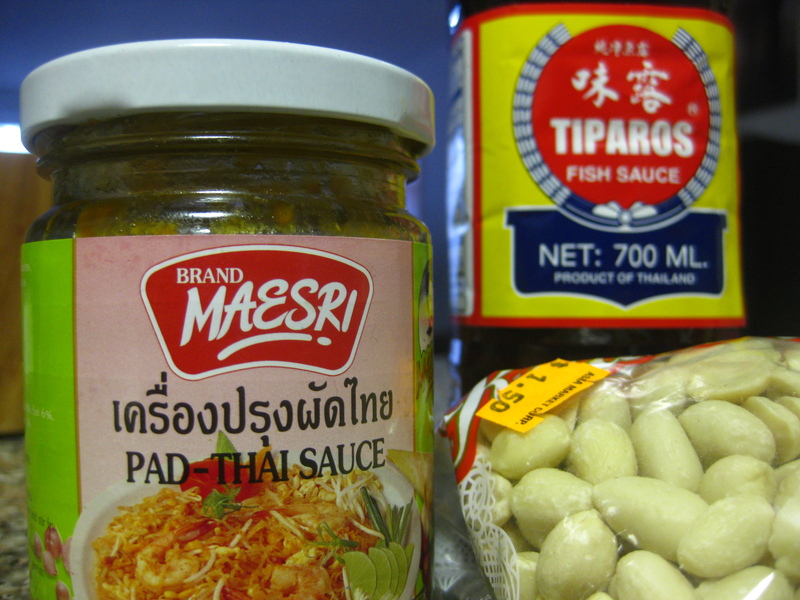 However, when I was shopping for curry paste, I also saw the Maesri Pad Thai sauce and thought “why not?” Plus, I don’t know how often I would use tamarind so figured may as well save shelf space. 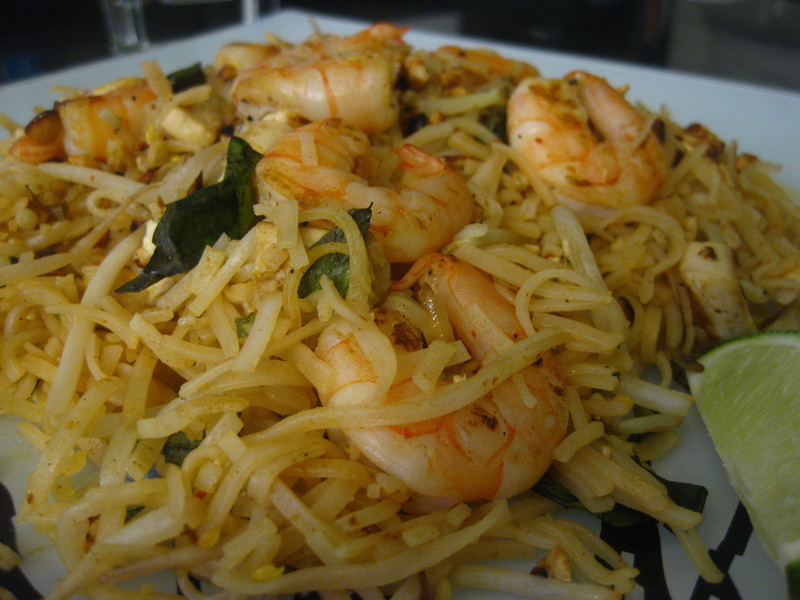 I combined various recipes found online, but primarily used the recipe from Thai Table. To try making Pad Thai from scratch, check out the recipe I learned from my Thai Cooking Class in Phuket. Also, caution about serving sizes… when I saw that half a package of rice noodles was for 2-3 servings, I tried to cook the whole package and double the recipe. It’s not that it isn’t doable, it’s just that it’s really difficult to mix because it will fill your wok or largest pot up to the brim. If you do need to double the recipe, I’d recommend to use 2 woks or large pots, otherwise you will have noodles and bean sprouts flung everywhere and things will get super messy. Heat up your wok or large pot over medium-high heat. Fry the peanuts until toasted (you can use oil but dry heat works too — just watch carefully so it doesn’t burn) and then set aside for later use. Leave the heat on high and add the oil to your wok. Mix in the garlic, shallots, and tofu and stir fry until they start to brown. Add the shrimp and sauté until pink. Make room for the egg by pushing the shrimp and tofu to the edges of the wok, and crack the egg in the middle. Scramble the egg until almost completely cooked. Add the noodles and the pad thai sauce to the wok. Stir quickly to avoid sticking. Mix in the bean sprouts, scallions, and cilantro/thai basil. You can set some herbs aside for garnish later. The noodles should be very soft and tangled. Add ground black pepper and red crushed pepper flakes to taste. Here is where you can tweak with more sauce, heat, sweetness, etc. Transfer to a serving platter and sprinkle the roasted peanuts on top. Garnish with fresh herbs and serve with a lime wedge.